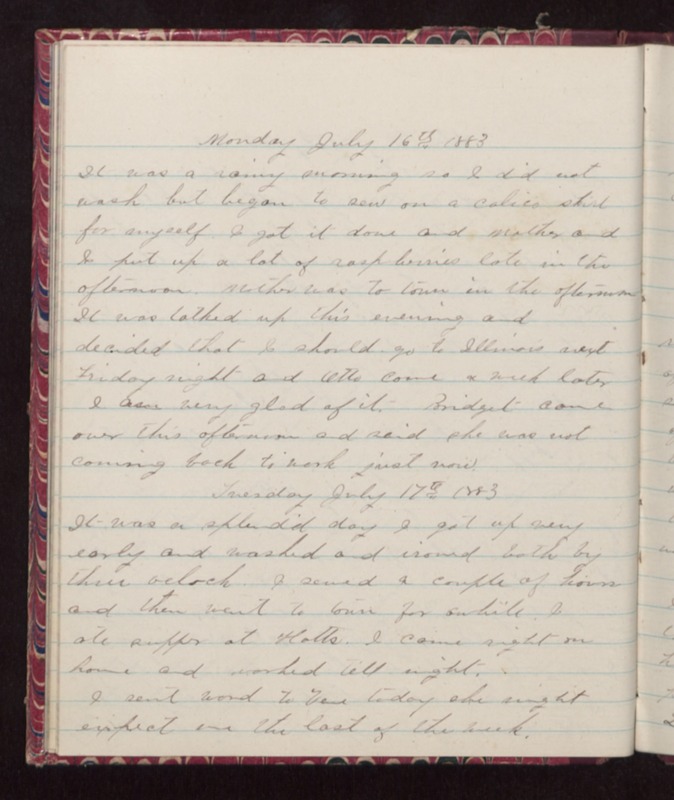 Monday July 16th 1883 It was a rainy morning so I did not wash but began to sew on a calico skirt for myself. I got it done and Mother and I put up a lot of raspberries late in the afternoon. Mother was to town in the afternoon. It was talked up this evening and decided that I should go to Illinois next Friday night and Otto come a week later. I am very glad of it. Bridget came over this afternoon and said she was not coming back to work just now. Tuesday July 17th 1883 It was a splendid day I got up very early and washed and ironed both by three oclock. I sewed a couple of hours and then went to town for awhile I ate supper at Hatts. I came right on home and worked till night. I sent word to Vene today she might expect me the last of the week.